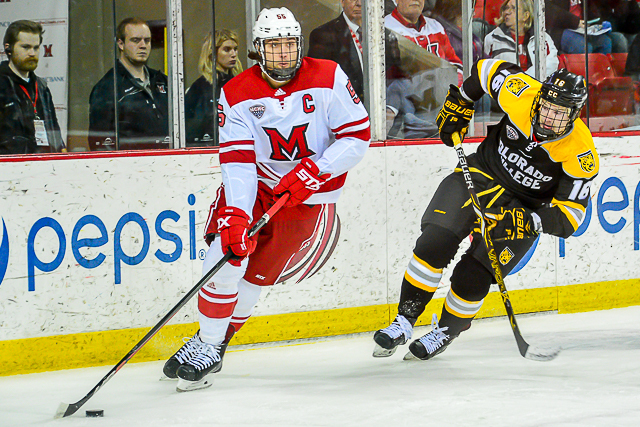 Images from the series played between Colorado College and Miami at Cady Arena in Oxford, Ohio, on Jan. 25-26, 2019. All photos by Cathy Lachmann/BoB. OXFORD, Ohio – It was a fitting end to a dreadful January for Miami. 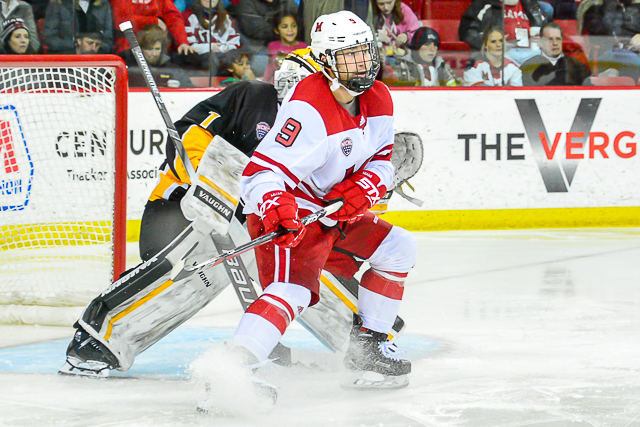 Kristian Blumenschein blasted home a one-timer from the high slot on a 5-on-3 with 3:12 left in regulation, lifting Colorado College to a 3-2 win over the RedHawks at Cady Arena on Saturday. MU led, 2-1 entering the third period. Miami (9-13-4) finished January 0-7-1 and is winless in its last 12 (0-8-4). The RedHawks have lost six games in a row. The game ended with MU coach Enrico Blasi drawing a game misconduct for confronting the officials after the game. That bench penalty could carry a suspension. 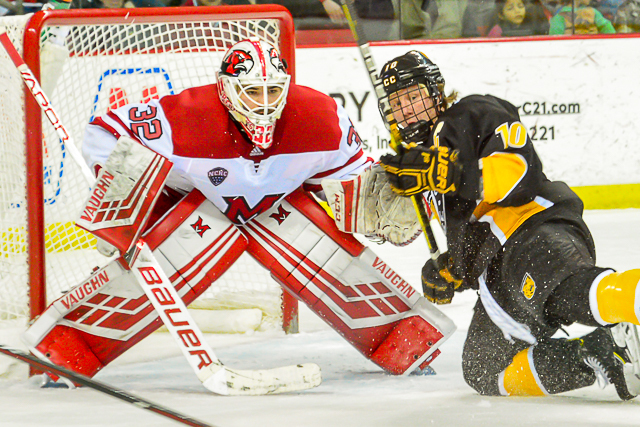 RECAP: Colorado College (10-12-3) took the lead just 3:54 into the game when Trey Bradley kicked a pass back to a wide-open Ben Israel in the high slot, and Israel trapped it, wound up and wired it over the glove of Miami goalie Jordan Uhelski. 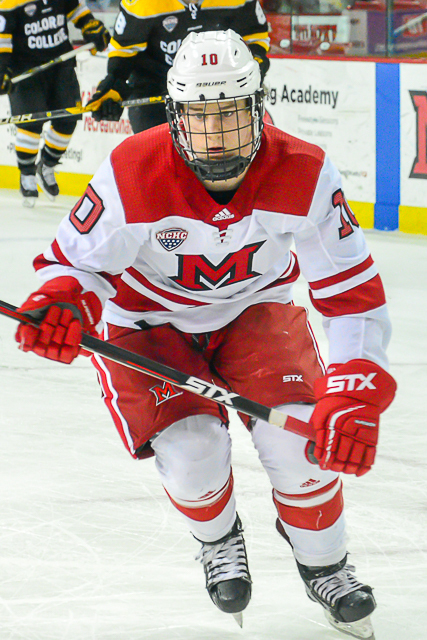 The RedHawks tied it when Scott Corbett carried the puck across the blue line on the right wing, dragged it to the top of the faceoff circle and wristed it inside the far post with 1:50 left in the opening stanza. Miami took the lead, 2-1 when Derek Daschke snuck a wrist shot through traffic on the power play with 7:35 left in the second period. But the Tigers tied it 86 seconds into the final frame when Alex Berardinelli emerged from along the boards with the puck, slid a pass through the slot to a wide-open Cole McCaskill, who snuck in on the back door for a tap-in goal. 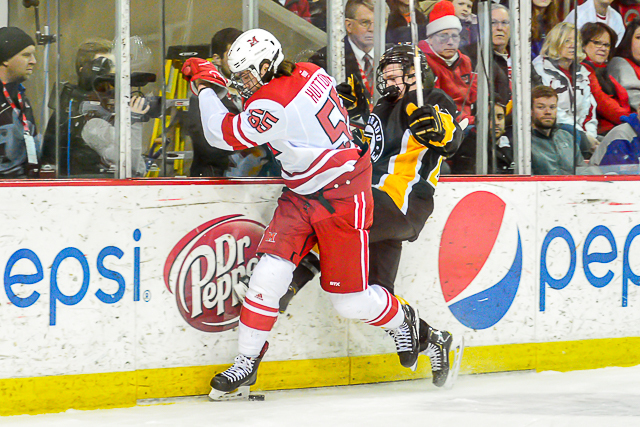 The RedHawks’ Casey Gilling was whistled for interference to give Colorado College the decisive power play. 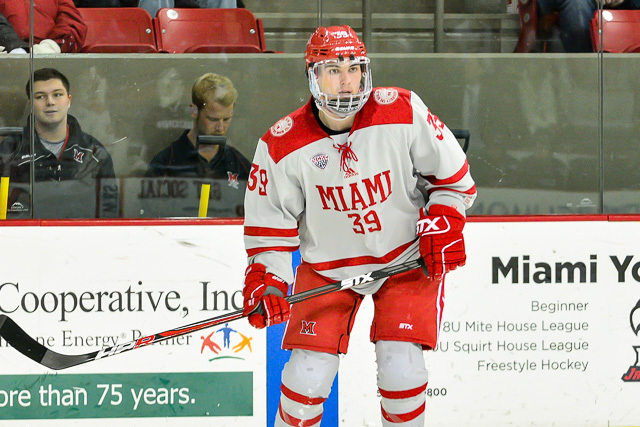 Miami went down two men when Andrew Sinard kicked a CC skater’s stick as he reached for it. Blumenschein ripped his shot over the glove of Uhelski off a feed from Mason Bergh to put CC ahead. Following the goal, Blasi grabbed a Miami stick and wound up to throw it on the ice but instead shattered it on the boards. After the game Blasi and referee Scott Bokal jawed at each other at the Miami blue line, sticking their fingers in each other’s faces. STATS: Daschke scored for the second time in five games, and Corbett snapped a seven-game scoreless streak. — Gilling picked up an assist, giving him points in consecutive games. — Miami did win 62 percent of its faceoffs (31 of 50) after struggling mightily in that area much of this month. — Now the bad: The RedHawks slipped to 1-21-6 the past three seasons when pursuing their 10th win. — Miami is 1-11-2 in January the past two seasons. — The RedHawks took the lead and held it for 8:01. It was the first time MU had led at any point in seven games. The penalty on Sinard was crucial, and it nearly gave Blasi a coronary. * With the score tied at two, Sinard was whistled for interference at 15:17 of the third period, setting up a 1:23 two-man advantage. He didn’t do the “distinct kicking motion”, the term hockey throws around when pucks hit skates and result in goals, but made no attempt to avoid the stick. * Did he do it deliberately? Unclear. He was heading to the bench and maybe he didn’t see it. If someone held a gun to my head and made me pick a side, I’d say he probably knocked it away on purpose. Technically that’s a penalty. However, the bar is almost always higher when putting a team down two skaters, which results in a goal against a substantial percentage of the time. * Also, these officials had called a total of two penalties on Friday – one to each team – and just three each prior to Gilling and Sinard’s minors. * Blasi was also outraged that the officials didn’t make the proverbial make-up call when Grant Hutton was bumped seconds before the goal, but there wasn’t much contact there. * Were Blasi’s antics following the goal on the bench and also after the game, rehearsed? Knowing him, probably not. It was more likely a frustrated coach losing his mind after a winnable game slipped away. But even if it was, I think it’s a good thing he lit them up. This team seriously underachieved this month and someone or something needed to fire Miami’s players up. Especially with a series at St. Cloud looming next weekend. * For the record, the last time Blasi was kicked out of a game was Feb. 13, 2010 in a 10-2 rout at Bowling Green that also featured one of the team’s most memorable skirmishes. * The Call – and resulting goal – was a huge part of the game, no doubt, but there are plenty of other questions about how this game flipped from a win to the ‘L’ column. How did Miami end up with four shots in the third period against a team that had allowed 24 goals in its previous seven games? Why is Gilling taking an interference call an area code away from the play to initiate that power play? Why did the entire team flood the left wing in the second minute of that final frame, allowing a wide-open McCaskill an uncontested tap-in to tie it? Why didn’t Phil Knies bust it on the left wing earlier in the 3-on-5 when Miami had a 2-on-1 to create a better scoring chance? It was a hard way to lose, no doubt, but there were many other factors that went into this loss than merely a controversial interference call. — What a crazy shift for Scott Corbett in the second period. He nearly scored, held off several Colorado College defenders along the boards and had the puck roll off his stick for a 2-on-1 the other way before obliterating a Tigers skater at center ice and drawing a retaliation penalty. That power play culminated in Daschke’s goal, and Corbett scored the other one in the first period. — It’s probably a little less than 50/50 that Blasi is suspended, and if he is it would likely just be for a game, but any announcement would likely be made on Monday. FORWARDS: C-. A little more life than Friday but not enough. 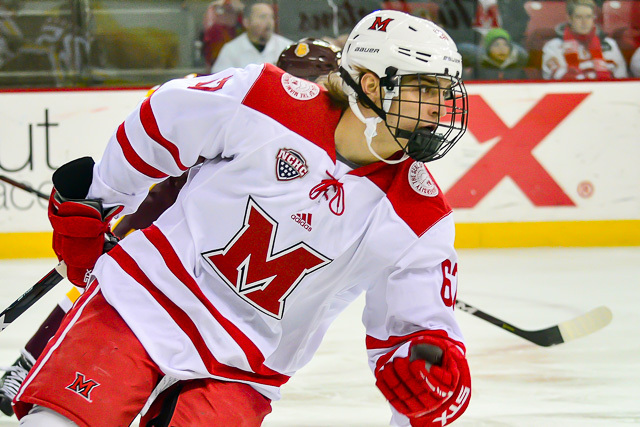 The creativity of Gordie Green and Karch Bachman has been completely stymied by defenses for weeks and Miami isn’t deep enough up front to have its top scorers held off the scoresheet for long periods of time. Corbett figured in both goals (although he didn’t get a point for the second one), and Gilling and Jonathan Gruden earned assists. Gruden’s father, NY Islanders assistant John Gruden, was in attendance because of the All-Star break. DEFENSEMEN: C. This corps did clean up its play substantially over Friday but is still allowing too many quality chances. No one picked up the trailer on the second CC goal (Bray Crowder and River Rymsha were on the ice) and the Tigers ended up with at least 10 shots in each period. GOALTENDING: B. The first goal snuck through traffic, the second was a slam dunk and the third was a rip from the high slot. Maybe Uhelski could’ve stopped the first or last, but he made a radical save on a 2-on-1 (Corbett’s shift, see above) and stopped 31 shots overall and was outstanding at controlling his rebounds. LINEUP CHANGES: Just one among skaters: F Carter Johnson was back on the ice, replacing Zach LaValle. LaValle had played the previous three games and Johnson had sat the prior two. Uhelski started for the third time in five games and relieved Ryan Larkin in the other two. He has been the back-up most of this season but is the hotter of the tandem right now, so it will be interesting to see how much he plays the final 10 games of the regular season. Co-captain Josh Melnick remains week-to-week with a lower body injury, as he missed his sixth straight game. There’s a very good chance he returns next weekend. Chaz Switzer was in the stands wearing a boot and fellow D-man Grant Frederic is also out with a lower-bod injury. SCHEDULE: Miami heads to No. 1 St. Cloud State next weekend. Its other remaining road contests are against No. 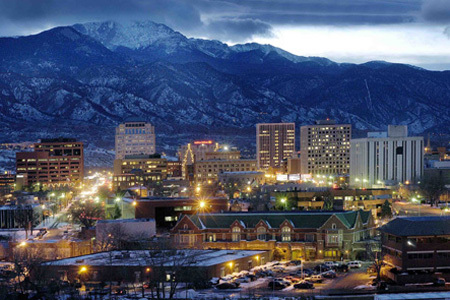 4 Denver and No. 5 Minnesota-Duluth. The four home games left on the RedHawks’ schedule are vs. Nebraska-Omaha in two weeks and No. 13 Western Michigan to wrap up the regular season. STANDINGS: Colorado College entered the weekend needing all six points to pass Miami for sixth place in the conference standings, and the Tigers swept them all. 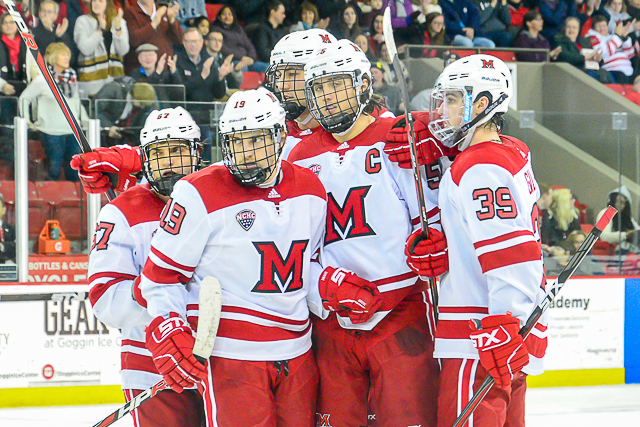 At 3-9-2, the RedHawks are currently seventh in the NCHC, just one point ahead of last-place Omaha. Miami has dropped to No. 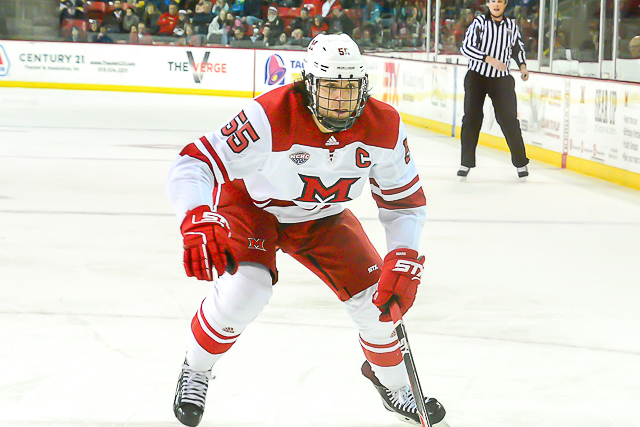 35 in the PairWise and are now a major longshot for an at-large bid to the NCAA Tournament. 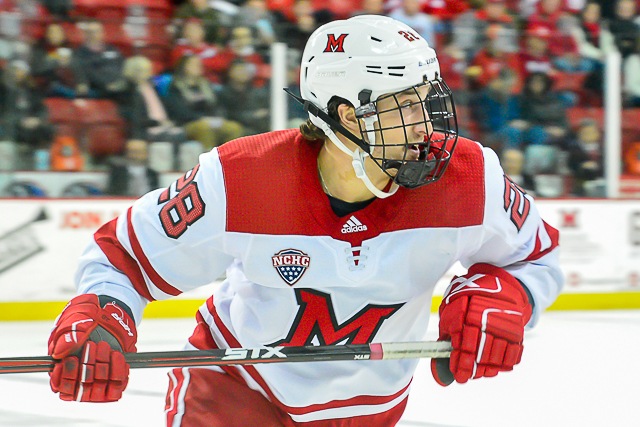 FINAL THOUGHTS: The question becomes: If Miami can’t beat Colorado College – playing its eighth and ninth straight road games – in its own rink, how many more wins will the RedHawks get? Their six remaining road games are brutal. Omaha is beatable but Western Michigan is ranked No. 13 and swept the RedHawks in Kalamazoo. Those seven and eight seeds are death sentences, with best-of-3s at St. Cloud State and Minnesota-Duluth in those teams’ rinks, so Miami really needs to figure out a way to earn enough points to get out of this hole. The disturbing thing is we’ve gone from wow, this team could fight for home ice and an NCAA berth to, OK, curb expectations because this is still a pieced-together team to for the love of God, Miami just got manhandled at home by the last-place team in the league — all in a span of 22 days. And now we’re questioning this team’s compete level, something that was never an issue in calendar year 2018. So what happened? Miami was going so well against St. Cloud, when the RedHawks tied the Huskies twice at Cady Arena to cap off the first half of the season. The loss of one of the captains is huge, no doubt, but that doesn’t explain not showing up for Game 1 of this series and blowing Game 2 in the third period against a CC team that had two previous conference wins. Hopefully the RedHawks’ coaching staff has the answer and solution, because it’s hard to be optimistic about Miami’s chances next weekend when the team is 0-8-4 in its last 12 and is visiting the top-ranked team in Division I. And at this point the RedHawks’ odds of advancing to the Frozen Faceoff and beyond for the first time in four years are looking equally bleak. 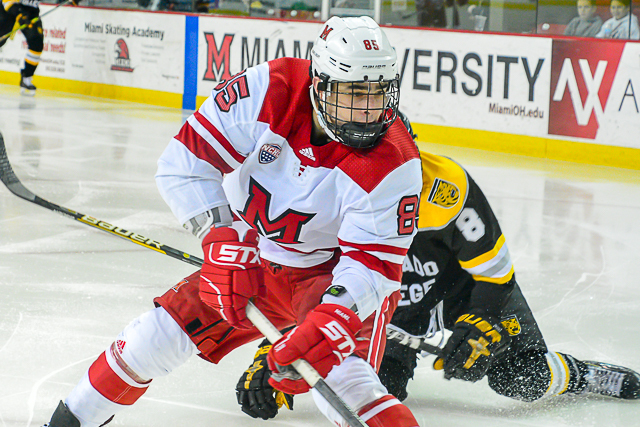 OXFORD, Ohio – With the last place team coming to town this weekend, Miami had an excellent chance to snap its 10-game winless streak. 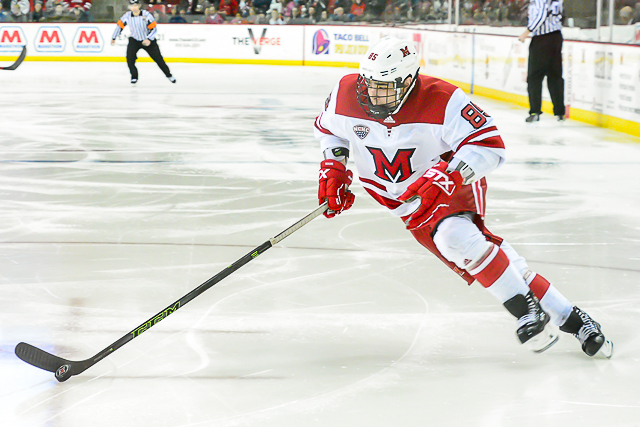 Instead the RedHawks suffered their worst loss of the season by goal margin, 6-1 against Colorado College at Cady Arena on Friday. The Tigers (9-12-3) scored three times in a span of 5:14 in the first period, and by the 10-minute mark of the second frame Miami was down five. 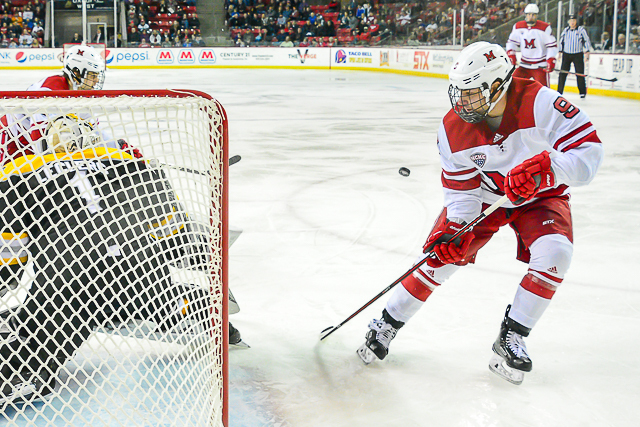 The RedHawks are 0-7-4 in their last 11 games with their last win coming vs. Colorado College on Nov. 17. 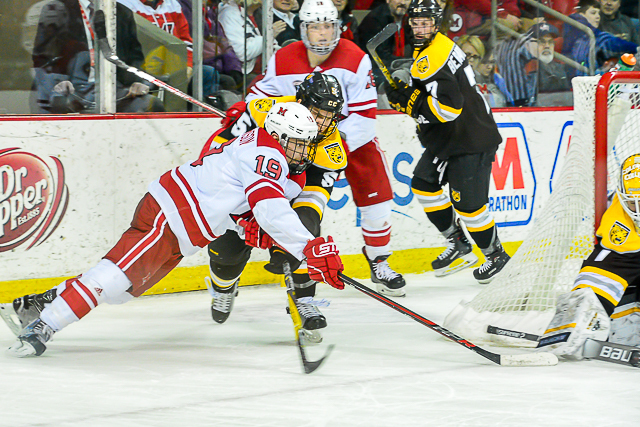 RECAP: Colorado College opened the scoring midway through the first period when Brian Williams backhanded a rebound home off a shot from Erik Middendorf, who had cut to the side of the net uncontested. Just 2:14 later, the Tigers scored on a 2-on-1 as Trevor Gooch centered a pass to Alex Berardinelli, who skated in alone and roofed one to the glove side. 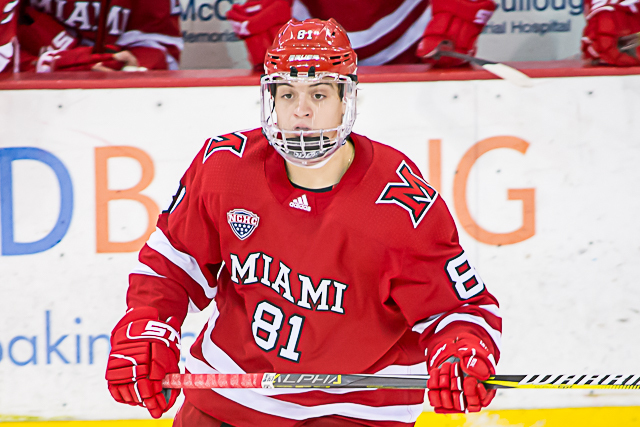 With 4:54 left in the opening stanza, Miami goalie Ryan Larkin made a save but the puck was loose under him and teammate Derek Daschke poked it out of the crease. Troy Conzo grabbed it, shot it off a body and seized the rebound, which he fired into the net. Intermission didn’t stop the bleeding for the RedHawks. At the 41-second mark of the middle frame, Trey Bradley emerged from a boards battle with the puck, skated behind the net and backhanded it into the cage to make it 4-0. That ended Larkin’s night, as Jordan Uhelski replaced him between the pipes. Williams buried a slap shot inside the far post from the top of the faceoff circle on a 3-on-2 created by a bad Miami line change midway through the second period. The RedHawks (9-12-4) scored their first goal in over 160 minutes when Grant Hutton stopped, wound up and ripped a slap shot that found the bottom of the net on the stick side from the blue line with 8:52 remaining in the second period. 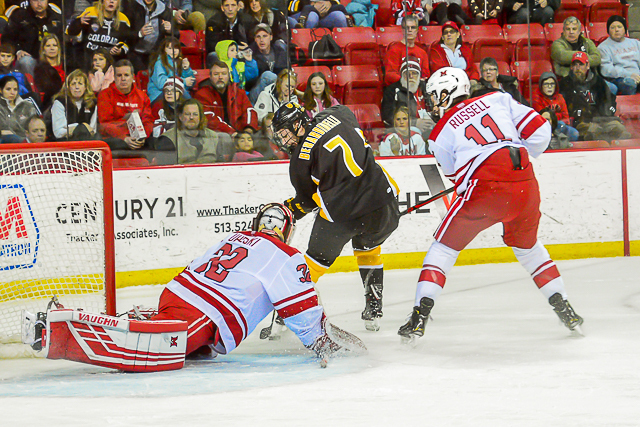 Colorado College sealed it when Christiano Versich buried a drop pass from Middendorf in the slot in the closing minutes. STATS: Hutton snapped a 13-game goal drought. It was the 27th goal of his career, unofficially tying him for third on the all-time Miami defenseman scoring list with Andy Greene and Joe Cook. Dan Boyle and Kevin Beaton are the only RedHawks/skins blueliners with more tallies. — Casey Gilling picked up the primary assist and also broke out of a funk by recording his first point in seven games and his first assist in 12. — Brian Hawkinson notched the other helper. He has a point in each of the last three games in which Miami was not shut out. — Larkin was pulled for the second straight start and has allowed eight goals on 34 shots in that span. 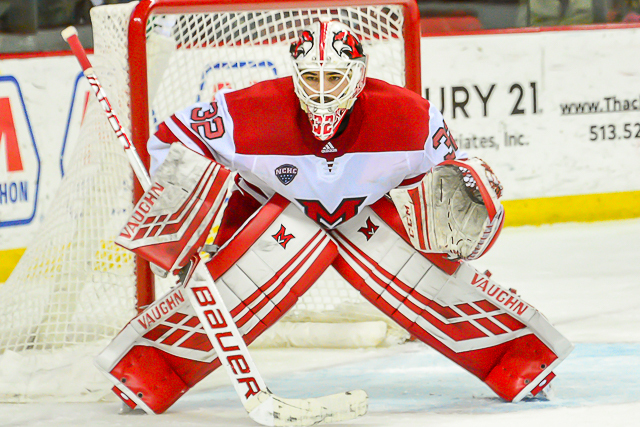 Uhelski has played in four consecutive games and is 95 of 103 for a save percentage of .922. — A positive? Despite all seven goals being scored at even strength, Phil Knies somehow went plus-1. 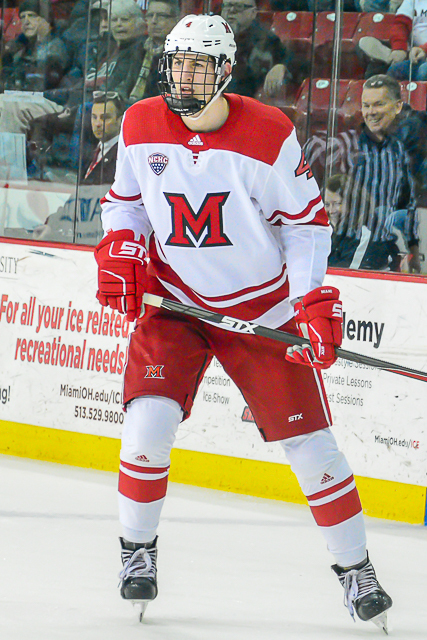 — Another positive: Miami was 30-23 on faceoffs, an area in which the RedHawks have struggled mightily in recent weeks. — A random one: Only two penalties were called all game, resulting in one power play for each team. The last time a Miami game saw two or fewer man-advantage opportunities was Jan. 18, 2013 at Wisconsin. In that game, the Badgers scored on their chance and won, 1-0. THOUGHTS: Paying fans should really demand a refund for this game. 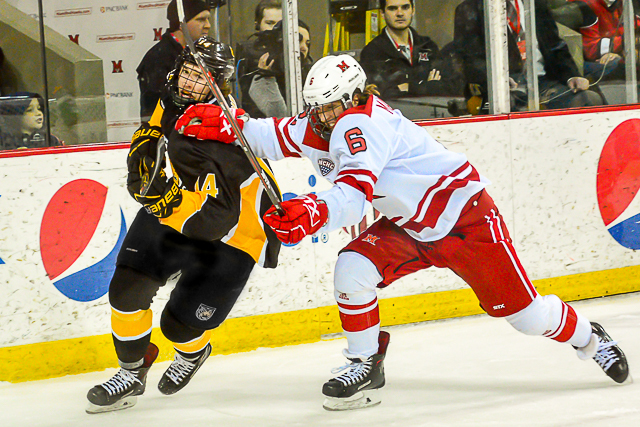 Colorado College, dead last in the NCHC, was playing its eighth consecutive road game, and Miami made the Tigers look like the Washington Capitals. During the first six games of this winless stretch, Miami played pretty well in each game and certainly had intensity every night. 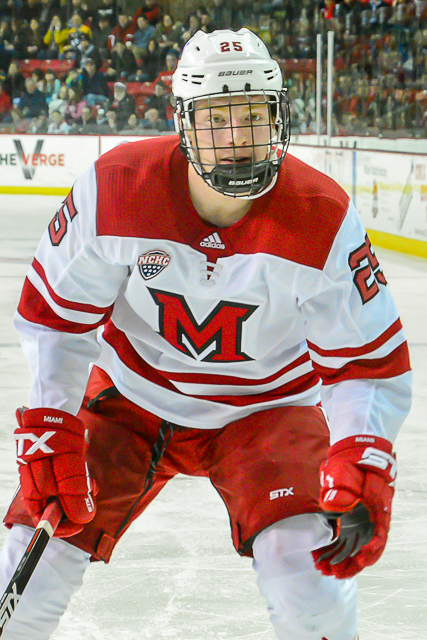 The RedHawks lost a pair of one-goal decisions on the road vs. a quality Western Michigan team, and then last week they were totally outmatched by Minnesota-Duluth, one of the top teams in Division I.
Colorado College was a tired cellar dweller going on the road and beating the bejesus out of a higher-skilled team. Miami was completely lifeless and fell behind 5-0. Hutton’s goal energized the RedHawks momentarily, but the damage had been done. MU Version 2018-19 is not a team built to erase a five-goal deficit. 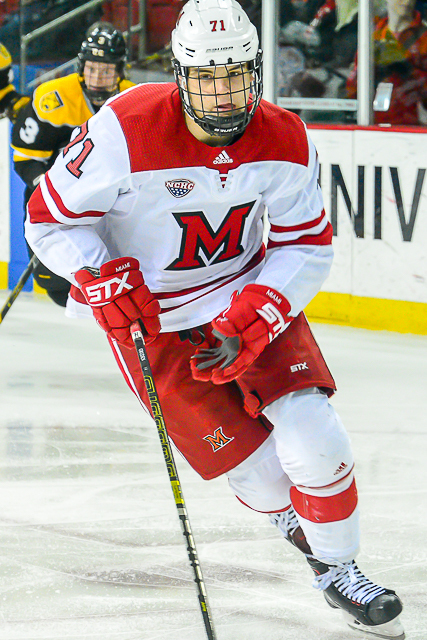 — What in the deuce was going on with Miami’s defensemen? Usually-dependable Rourke Russell was a turnover machine. Bray Crowder inexplicably skated to the boards on a 2-on-1, essentially allowing a breakaway goal that made it 2-0. Players were out of position all night. No one picked up Tigers cutting to the net. Andrew Sinard was a rare bright spot among this corps if for no other reason because he plays cautiously and makes safe passes. He used his long reach to knock pucks away from opponents several times and is earning more ice time as a result of that and injuries to other defensemen. — River Rymsha had an interesting night. He had played some wing this season but was the starting center in this one. He went 3-1 on faceoffs. Rymsha also was hurt, as he came off holding his shoulder. Based on the optics it appeared he would miss significant time, but he returned and looked 100 percent the balance of the game. FORWARDS: D-. The absence of Josh Melnick is having a crippling effect on this corps, which has not found the net in three games. Even Miami’s best most skilled forwards are struggling: Karch Bachman was minus-4, Jonathan Gruden minus-3, Gordie Green minus-3. DEFENSEMEN: F. Hutton’s goal bumped their grade from a ‘G-’. Their woes were documented above: Bad decisions, bad positioning, turnovers, flat-footedness. It was easily the worst effort of the season by the blueliners. GOALTENDING: C-. The first goal came off a point-blank shot that resulted in a rebound, so that can’t be blamed on Larkin. The second was a breakaway and a quality snipe. However, Larkin couldn’t control an innocuous shot on the third goal and was unable to get across to stop a wraparound on the fourth. Uhelski probably should’ve had the fifth one and the sixth was on an uncontested shot from the slot. LINEUP CHANGES: Hutton was back after sitting last Saturday and forward Noah Jordan sat scratched. Rymsha shifted to forward and Zach LaValle was the extra skater, dressing for the third straight game. Melnick missed his fifth consecutive contest. FINAL THOUGHTS: It was an all-around bad night at the rink. There’s simply no excuse for falling behind 5-0 by the midpoint of the second period against a team that had won one of its last seven games. The last team Miami beat was this Tigers team. But that was over two months ago in Colorado Springs, and this game showed how far the RedHawks have slipped since then. 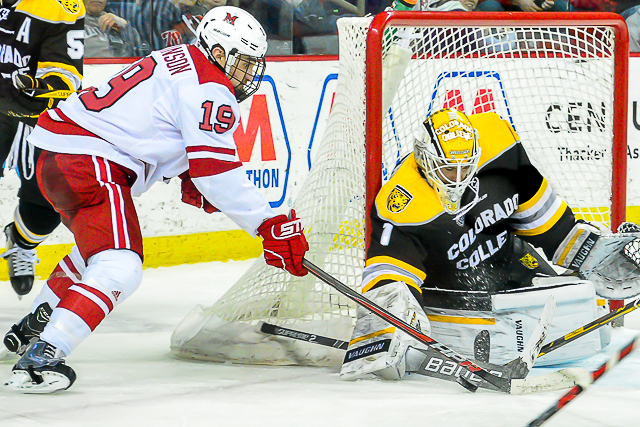 Like Miami, Colorado College is looking for its first win of 2019. The Tigers are 0-3-1 early this calendar year with all four games coming at home. CC is currently last in the NCHC with just eight conference points. 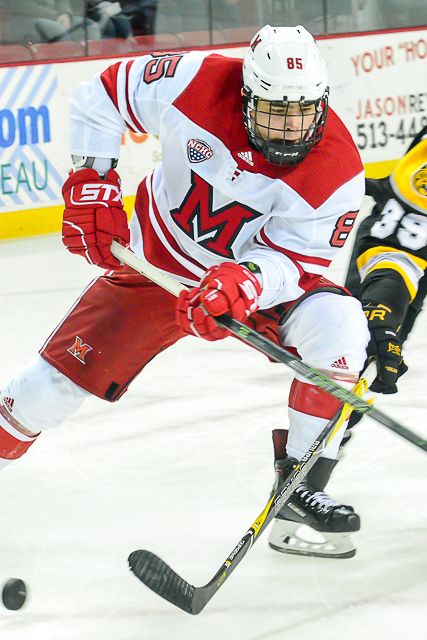 WHO: Colorado College (8-12-3) at Miami RedHawks (9-11-4). 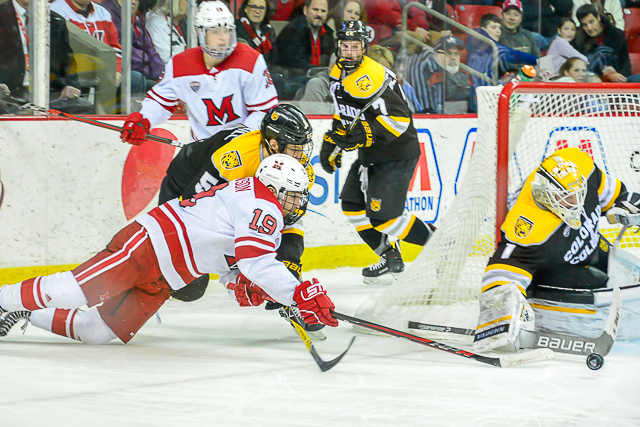 COLORADO COLLEGE RADIO: KRDO-FM (105.5), Colorado Springs, Colo.
NOTES: Colorado College is last in the NCHC but the Tigers have always given Miami fits, as the RedHawks are 1-3-1 in their last five meetings. CC averages three goals a game despite not having a skater over 17 points. Thirteen Tigers have found the net at least three times, and Westin Michaud leads the team in points with 17. CC’s top five points producers are forwards, with four being seniors and the other a junior. Michaud has scored eight goals, and Trey Bradley is tops among Tigers skaters in goals (9) and second in points (16). Mason Bergh has five goals and 10 assists, Trevor Gooch eight markers and five helpers and Nick Halloran has posted four goals and nine helpers for 13 points. Halloran is the lone junior among this corps – the rest are all seniors. Junior Alex Berardinelli is another major threat on a Tigers team that scores 3.00 goals per game. Berardinelli has scored seven times including twice shorthanded. 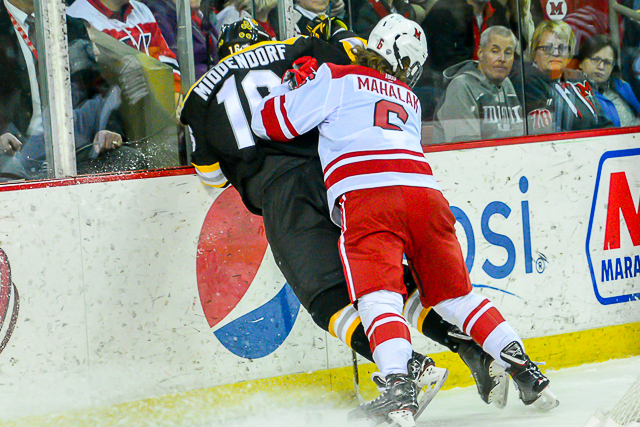 Colorado College has scored 69 times this season, but only three of its tallies have come from defensemen. Freshman Bryan Yoon is 1-12-13 and easily leads this corps in points. Zach Berzolla, Andrew Farny and Kristian Blumenschein are 0-6-6, 0-6-6 and 0-5-5 in 23 games each, respectively, and Ben Israel, Cole McCaskill and Alex Pernitsky have logged the remainder of the defensemen minutes for the Tigers. Junior Alex Leclerc has logged over 90 percent of the team’s minutes in net, going 8-11-3 with a 2.73 goals-against average and a .910 save percentage. This wraps up a ridiculous nine-game road trip for the Tigers, who are 1-5-1 in their current stretch away from World Arena. Colorado College’s last three games have all gone to overtime, and the Tigers lost two, both at North Dakota. The Tigers had a game against Denver postponed last weekend because of weather. Miami is 0-6-4 in its last 10 games and has not scored in 141:26. Captain Josh Melnick has missed the last four games with a lower body injury and is questionable to return this weekend. In four meetings last season, No. 20 Miami only beat Colorado College once, with that win coming in overtime. 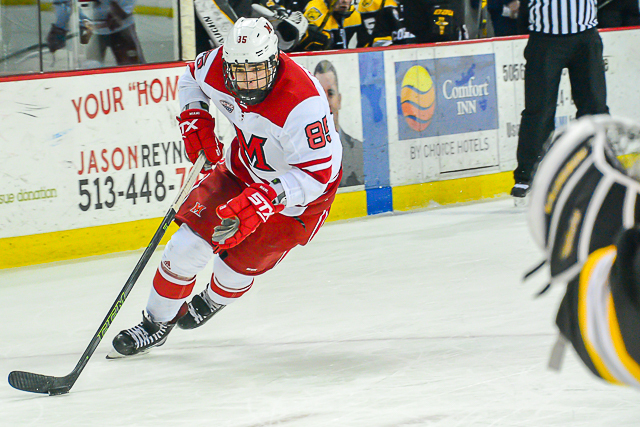 In its first win over the Tigers since, the RedHawks again won in an extra session. 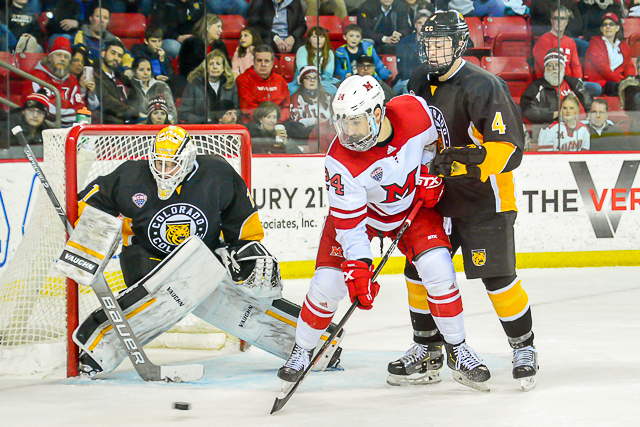 Casey Gilling fired home a power play shot from the high slot to lift MU to a 3-2 win over CC at the 2:19 mark of overtime on Saturday as the teams split the weekend series. The RedHawks (9-5), who led by two after the first period before CC rallied to force the extra session, are now 3-3 in the NCHC, one-quarter of the way through league play. 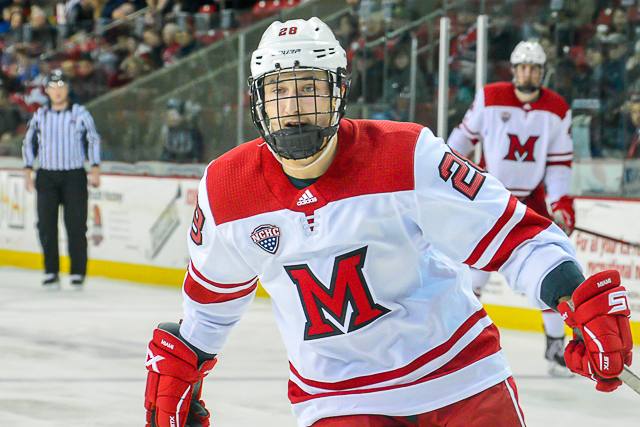 RECAP: River Rymsha fired a shot from the left point that found its way, opening the scoring for Miami with 5:25 left in the first period. The RedHawks extended their lead to two four minutes later. Josh Melnick slid a pass between his legs to Scott Corbett, whose shot was denied, but the rebound was backhanded in by Derek Daschke at the top of the faceoff circle. Colorado College (5-6-1) cut the Miami lead to one four minutes into the second period shorthanded when RedHawks defenseman Alec Mahalak tried to break up a cross-crease pass, but it went in on MU goalie Ryan Larkin, and after he deflected it to side of the net, Mason Bergh banged home the loose puck. Bergh tied it with 3:49 left in the middle stanza on a one-time blast from the right wing faceoff dot on the power play for his third goal of the weekend. Corbett was whistled for a penalty with 1:50 remaining in regulation, and Colorado College couldn’t score, but the Tigers took a minor in the extra frame to set up Gilling’s game winner. Gilling wristed one toward the net but it broke the stick of CC’s Tanner Ockey and came back to Gilling, who snuck one in on the stick side to win it. STATS: Daschke and Melnick both finished with two points, as Daschke scored once and picked up an assist and Melnick ended up with a pair of helpers. — Daschke has nine points in nine games and Melnick has 11 in eight games. Melnick also went 22-7 in the faceoff circle. — Gilling now has seven points in as many contests. THOUGHTS: A popular mentality is that the altitude catches up to opposing teams on Saturdays when playing a weekend series a mile above sea level, but Miami scored in Minute 122 of this set. Like Friday, the RedHawks were dominated for portions of this game, especially in the second period, but they still found a way to win. — Larkin seemed skittish at times in this game but settled down for the stretch run and obviously shut CC out the final 26 minutes. He has allowed exactly two goals in four straight contests. — Andrew Sinard started the game paired with Bray Crowder but Rymsha took over his defense spot later in the game. Not sure if Sinard was hurt or benched. — On that note, a full disclosure: I watched this game on NCHC TV but had major internet issues and was reduced to viewing the balance on the phone. So we’ll keep the opinions to a minimum. LINEUP CHANGES: Only one: Noah Jordan dressed for the third time this season and fellow forward Zach LaValle sat. Coach Enrico Blasi has gotten away from playing F Carter Johnson and Ds Chaz Switzer and Grant Frederic. FINAL THOUGHTS: Miami blew a two-goal lead but won in overtime and is now 3-3 in the league despite playing four of those six games on the road. The league schedule gets a lot tougher from here so these slow starts aren’t going to fly. Not as strong of a schedule vs. 2017-18, admittedly, but still: 9-5 after 14 has a good sound. Miami has not been a Friday team this season. On this particular Friday, the No. 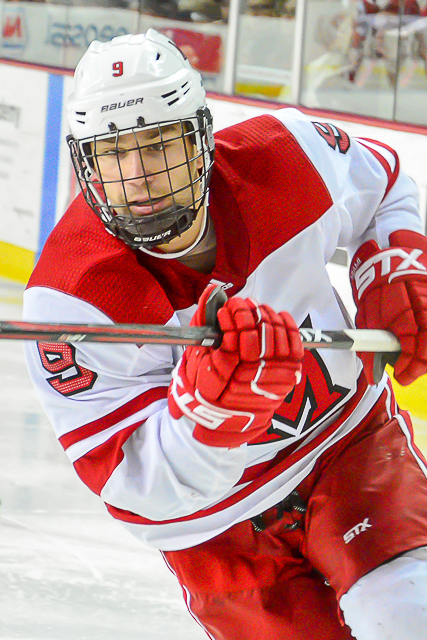 20 RedHawks struggled early, gave up the go-ahead goal late in the second period and failed to capitalize on a 5-on-3 in the final stanza, culminating in a 2-1 loss at Colorado College. 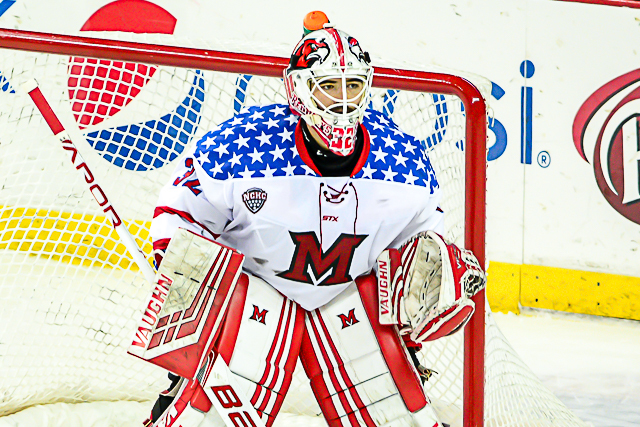 Miami is still 8-5 overall but fell to 2-4 on Friday, meaning the RedHawks are 6-1 on Saturday and Sunday. Karch Bachman scored the lone goal for MU, tying the score eight minutes into the middle frame. RECAP: The Tigers (5-5-1) dominated the first 20 minutes and came out of the first period ahead, 1-0. Trey Bradley took a drop pass in the high slot and fired it on net, and though Miami’s Ryan Larkin kicked it aside, it caromed directly to the goalie’s right where waiting Mason Bergh whipped it in from the bad angle 7:45 into the contest. The RedHawks (8-5) tied it with 11:56 left in the second period when Karch Bachman carried the puck into the offensive zone and fired a shot around his defender and into the top left corner. But Colorado College regained the lead eight minutes later when Erik Middendorf one-timed a pass home from Alex Berardinelli. Berardinelli had grabbed a loose puck at the blue line after Zach LaValle tried to pass up ice and had his stick shatter. 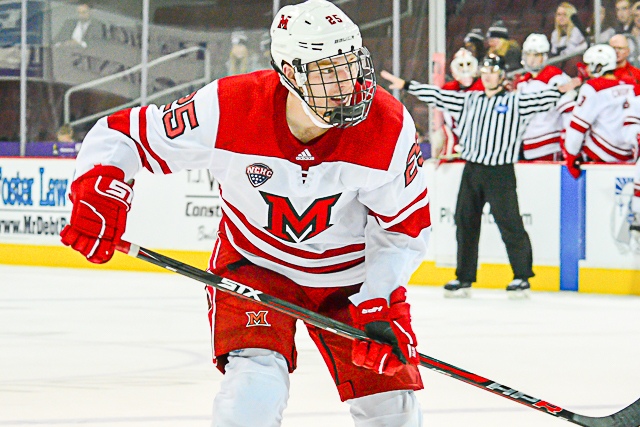 The Tigers were whistled for overlapping penalties early in the third, creating a 46-second two-man advantage for Miami, but the RedHawks were unable to generate the equalizer. STATS: Bachman has scored in consecutive games for the second time this season and leads the team in goals with five. — Gilling picked up his sixth point in his last six, as he is 1-5-6 in that stretch. Larkin earned his first point since Oct. 28, 2017 with his secondary assist. — Larkin has allowed exactly two goals in each of his last three games, stopping 90 of 96 shots in that span (.938). 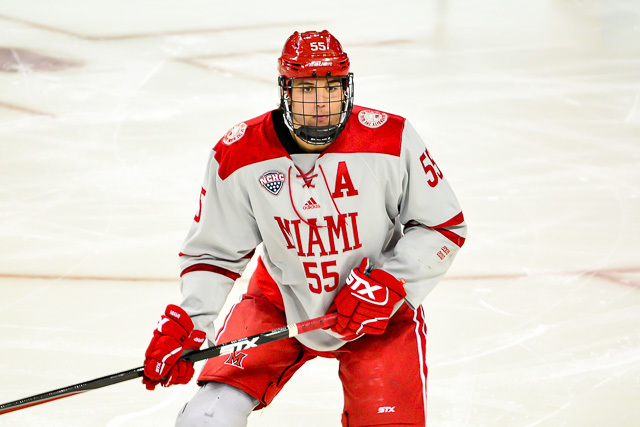 — Miami extended its winless streak vs. Colorado College to four games. The RedHawks are 0-3-1 against the Tigers dating back to Nov. 3, 2017. — MU outshot its opponents in eight of its first nine games, but its foes have more shots than the RedHawks in their last four. Colorado College edged out Miami, 31-30 in this contest. THOUGHTS: Like last weekend, the RedHawks weren’t ready for this one as they were dominated early. That resulted in a 1-0 CC lead, and while Miami tied it, a bad-luck goal by the Tigers ultimately sealed it. In six Friday games this season the RedHawks have only scored three first-period goals, so the slow series starts are becoming a concern. 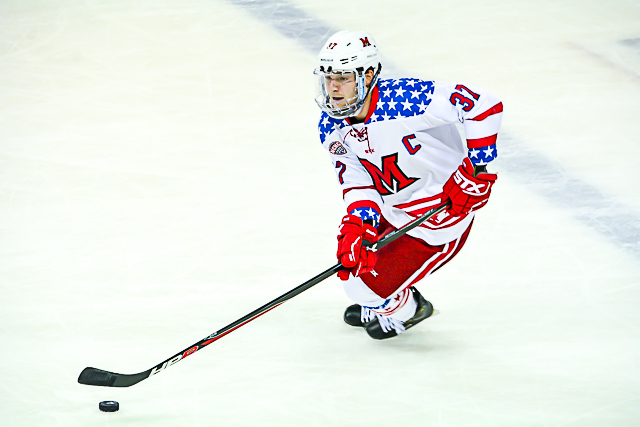 A poor start to the North Dakota series eliminated any chance of a Miami win last Friday. — We’ve been saying it all season, but how about the improvement by Bachman? He was 1-on-1 entering the zone and still ripped it home for his goal. He’s now winning battles in the corners and regularly forcing turnovers. 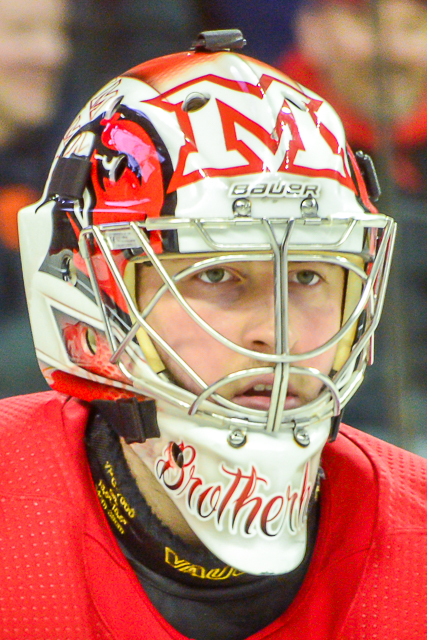 — He was well defended in The decisive goal was pretty unlucky for Miami, as LaValle’s stick broke while he was trying to send the puck out of his zone, but instead it ended up in the RedHawks’ net. — Gilling was limited to one point his first seven games but has six in his last six. He has really upped his game at every level in recent weeks. — Interesting that Coach Enrico Blasi is playing the two huge freshmen D-men, Bray Crowder and Andrew Sinard, on the same pairing. LINEUP CHANGES: Unfortunately, Phil Knies was not in the lineup for the first time in his career. 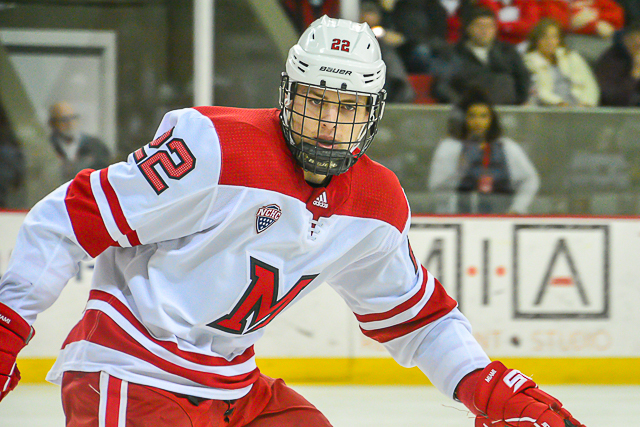 He suffered an upper-body injury early in last Saturday’s win over North Dakota. Sinard dressed in his second straight game for the first time this season, and Carter Johnson has now missed consecutive contests. FINAL THOUGHTS: Miami has to realize that it can’t just show up for the final 40 minutes and hope to win. 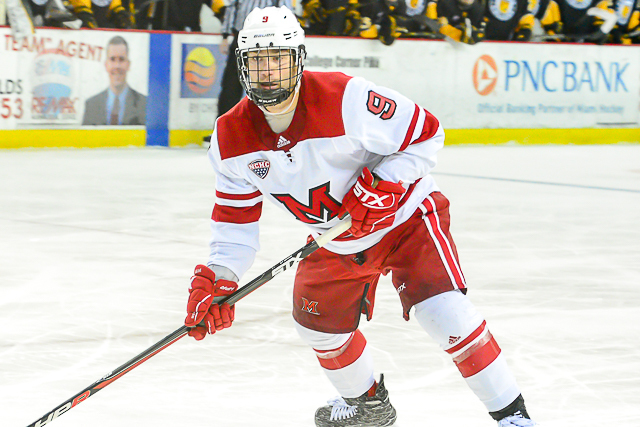 The RedHawks spotted Colorado College the first 20 minutes and the teams were basically even the last two periods, but that 1-0 difference in the opening stanza was the difference. 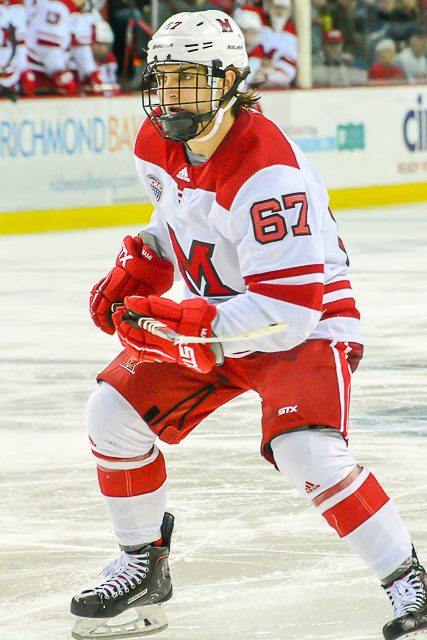 Relatively speaking, Miami has had it pretty easy to open NCHC play – the RedHawks played UNO, which has won two games, and North Dakota before heading to Colorado Springs to face a team that was previously 0-4 in the league – and MU is just 2-3 in conference play. The 10th win has been incredibly elusive for Miami. The RedHawks’ victory total never did reach double digits in 2016-17, as they went 0-9-1 in February in March to end the campaign with nine wins. 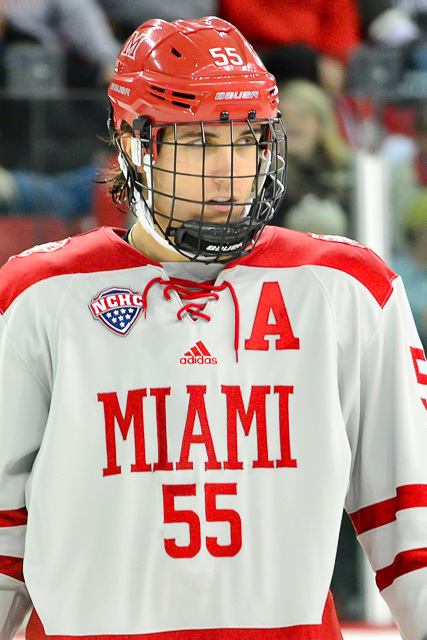 Miami is stuck on nine again this season, as it extended its winless streak to five games on Saturday by tying Colorado College, 4-4 on Saturday. That means the RedHawks are 0-13-2 in pursuit of win No. 10 dating back to last season. 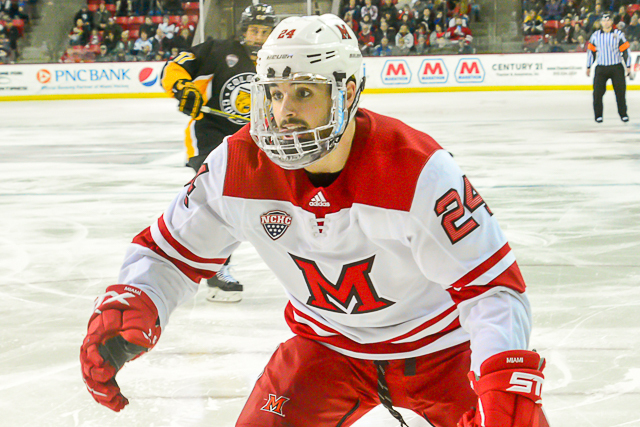 Miami’s at-large window is closing quickly, and it’s becoming more apparent that MU will have to run the table in the NCHC Tournament to avoid missing the NCAAs for the third straight season. RECAP: It was a crazy game, with the Tigers scoring twice in the first three minutes to take a 2-0 lead. 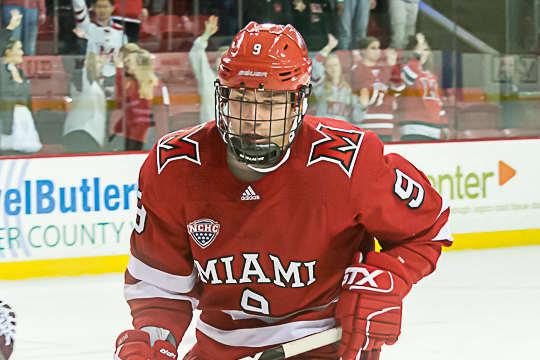 Miami answered with four consecutive goals, including two by Carson Meyer. But Colorado College cut its deficit to one in the closing minutes of the second period and tied it with 11:04 left in regulation. Neither team scored in overtime, but the Tigers earned the second point with a 3-on-3 goal. STATS: Lost in Miami’s struggles is Phil Knies’ scoring streak. He found the net for the fourth straight game and has netted six goals in that span. He had three in his first 20 games. — Meyer was scratched in the finale at Nebraska-Omaha but scored twice for the first time this season. He also added a helper for his second career three-point game. — Kiefer Sherwood notched two assists as he extended his points streak to seven games (3-8-11). It’s great to see both Sherwood and Meyer thriving after slow first halves. 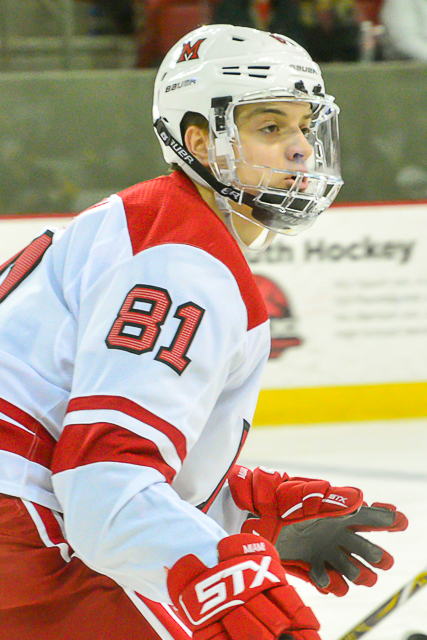 — Louie Belpedio finished with a goal and a helper as he recorded his seventh multi-point game of the season. 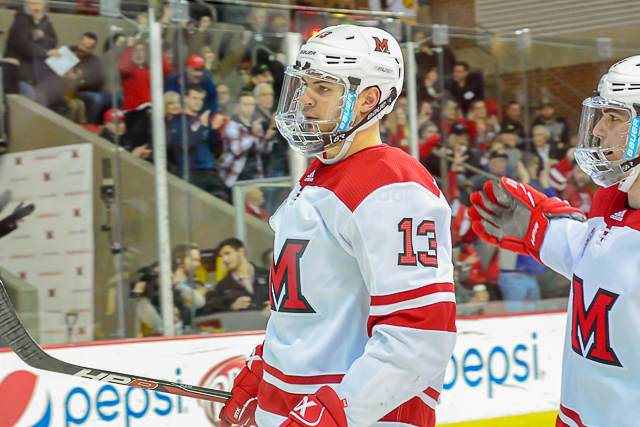 THOUGHTS: To its credit, Miami fell behind by two early but rallied to take a 4-2 lead. Then the RedHawks blew said lead as they salvaged just one of a possible three points. Once again a late advantage was squandered and Miami left valuable league points on the table. The funny thing is that through 24 games, the RedHawks have actually allowed the same number of goals in each period: 27. It’s the timing of those goals against that is killing this team. 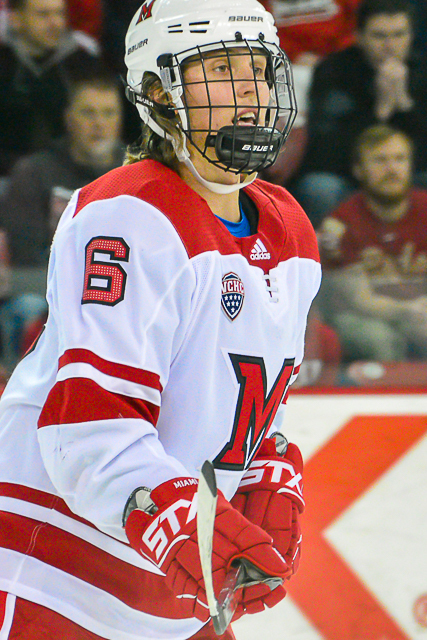 This 0-3-1 road set against the sixth and seventh place teams in the NCHC has left Miami buried in last, six points behind Colorado College. The RedHawks do have two games in hand against the entire league save St. Cloud State, but Miami’s remaining schedule consists of two games against each of the top five teams in the conference. It’s baffling that this MU team that was 8-8-2 at the break and won its first game of 2018 against league power Denver looks so lost now. And it isn’t like Miami was a horrible road team: The RedHawks were 3-3-2 away from Cady Arena entering the UNO series two weeks ago. — MU is allowing 5.8 goals per game during its five-game skid. That’s embarrassing. Granted UNO has the best offense in the NCHC but Colorado College is second last in scoring. Only Miami scores less frequently, with 75 goals in 24 games vs. CC’s 79 markers. — A number of otherwise intelligent people are toying with the notion that a change of conference might be the best thing for Miami. This has to be the worst idea since the glowing puck or the NHL expanding to Atlanta a second time. So the problem is that Miami has struggled to compete against the big boys the past few years. The solution is to admit defeat, say thanks for the invite but we’re not worthy of the NCHC and join a much weaker conference? 1) What’s the alternative? The Big Seven doesn’t want Miami. The WCHA is much weaker. Those are the only two leagues with teams remotely close to southwest Ohio. There is no longer a CCHA. When it dissolved, Miami had a chance to play in the best league in Division I and made the correct decision to join. Yeah, the schedule is brutal but the RedHawks only need to post a .530 or so winning percentage to get in. All of the other seven teams in the league are .500 or better. 2) Recruiting. A major issue being brought up is MU’s inability to land the same quantity of players as it did several years ago, right? 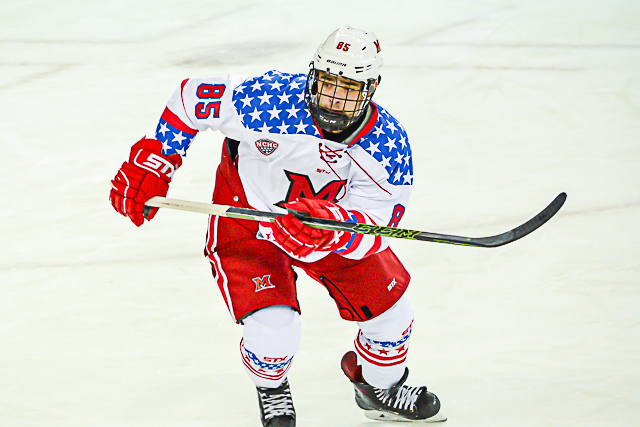 Do you think a 16-year-old is more likely to sign with a team that plays teams like Denver, North Dakota and Duluth each weekend or UAF, Ferris State and Northern Michigan? No offense to those former CCHA foes but they’re not household names in the college hockey world and they’re not consistently in the top echelon of Division I.
It’s EASIER to recruit when you play in this conference. Leaving it will not mean the Austin Czarniks and Reilly Smiths of the world will start again flocking to Oxford. Quite possibly the opposite. 3) Travel. You think Omaha then Colorado College is bad, think about the logistics issues of playing in a league with the three UP teams and both Alaska squads. Then throw in two more in Minnesota. No thanks. Hockey East was a disaster for Notre Dame largely for the same reason. The other leagues aren’t realistic either, and again, the Big Seven isn’t extending invitations. It’s an honor to play in the best league in college hockey, and no team in its right mind is going to step down because it has a few bad years. LINEUP CHANGES: The big one was the absence of standout Grant Hutton on defense. It’s unclear why he was not dressed, snapping a streak of 75 consecutive games played for the junior. It was just the second time in his career he was not on the lineup card, with the other being Jan. 9, 2016. If Hutton misses any amount of time it will make winning hockey games a whole lot harder for the struggling RedHawks. The other Grant – Grant Frederic – took his place on the ice. Up front, Ryan Siroky and Zach LaValle dressed after sitting on Friday. Austin Alger and Willie Knierim sat in their place. 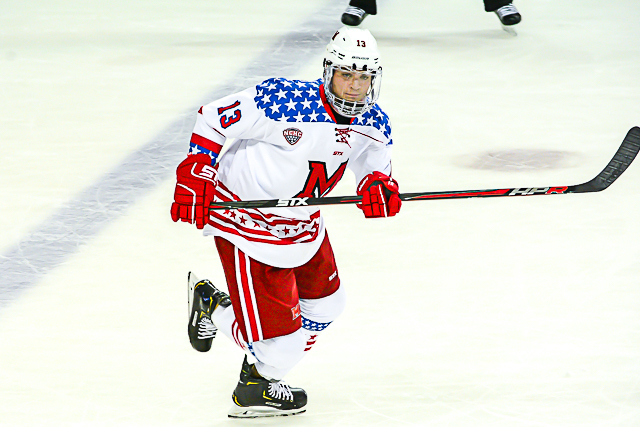 FINAL THOUGHTS: Miami plays its next four and six of its final 10 in Oxford, but now it faces an incredibly difficult path to get back into contention for home ice in the first round of the tournament. The only good thing about the remaining schedule is that the RedHawks play the teams multiple teams that they need to pass in the standings, so they control their own destiny somewhat. It was just five seasons ago when Miami held its opponents to 1.74 goals per game. 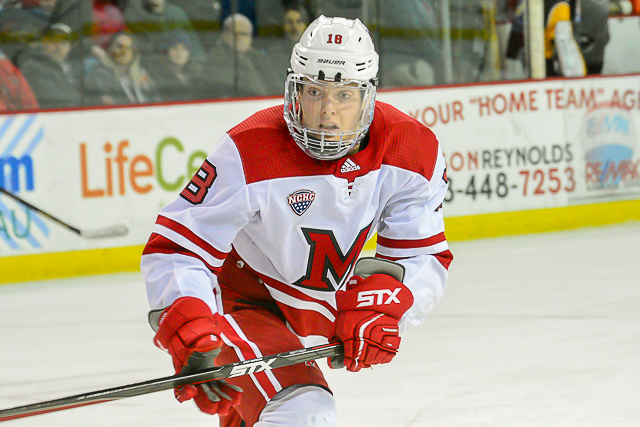 One of the top defensive teams in Division I half a decade ago, the RedHawks have allowed 21 goals during their current three-game road set alone, including Friday’s 6-3 loss at Colorado College. MU is surrendering goals at nearly twice the clip of 2013-14, as foes have lit the lamp 82 times in 23 games, an average of 3.39 goals against. RECAP: Didn’t see the game, just the highlights. Those 9:37 p.m. starts are a little late for those of us with early hours. It was never really a contest, as the Tigers scored 99 seconds in and ran out to a 5-1 lead. Miami scored twice to trim the deficit to two, but a CC empty netter sealed it. STATS: Kiefer Sherwood tied a season high with three points, scoring once and setting up the other two MU goals. — Freshman defenseman Alec Mahalak’s two points – both on helpers – were a career best. — Grant Hutton also picked up two points on a goal and an assist, giving him points in three straight games (1-5-6). — Colorado College was 3-for-3 on the power play, and Miami has now killed an absurd 5 of 13 chances during this road trip. That’s a 38.5 PK percentage. THOUGHTS: So Miami’s defensive struggles last season were documented regularly here, but the RedHawks were doing a better job in their own zone the first three months of 2017-18. But three games and 21 goals against into an 0-3 road trip later, it makes one wonder what the deuce is going on. Opponents are getting way too good of looks and goaltending is underperforming. And Nebraska-Omaha and Colorado College are both near the bottom of the NCHC standings table. Miami should’ve been past this, with Louie Belpedio playing the best hockey of his career in Games 1-20, Grant Hutton continuing to prove himself one of the best undrafted D-men in the conference. Chaz Switzer, Scott Dornbrock and Grant Frederic had all shown improvement. Alec Mahalak has also displayed a lot of promise and his confidence level seems to rise each night. 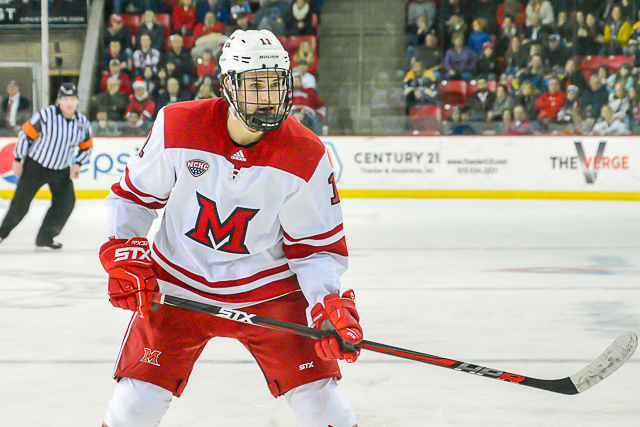 Forwards Gordie Green, Josh Melnick and Casey Gilling all are outstanding defensively, but too often Miami’s centers and wings aren’t getting back or don’t pick up opponents as they cruise toward the Miami net. Miami needs to tighten up, and quickly. Time is running out on the regular season, and drawing a low seed in the conference tournament is tantamount to a death sentence in the NCHC. LINEUP CHANGES: Carter Johnson returned to the lineup for the first time since the Bowling Green series. Carson Meyer was also back after being scratched in the finale at UNO. Zach LaValle and Ryan Siroky did not dress. On defense, Dornbrock returned after missing the second game vs. the Mavericks. He replaced Frederic. FINAL THOUGHTS: It’s a four-game losing streak for Miami, its longest of the season. Now three games under .500, the RedHawks’ path the NCAAs gets a lot tougher. MU really needed to sweep these games to have a decent shot at home ice for the first round of the NCHC Tournament and the potential for an at-large berth. Not that it’s mathematically impossible by any stretch, but the odds of Miami reeling off a bunch of wins in a row against its remaining opponents are not strong. 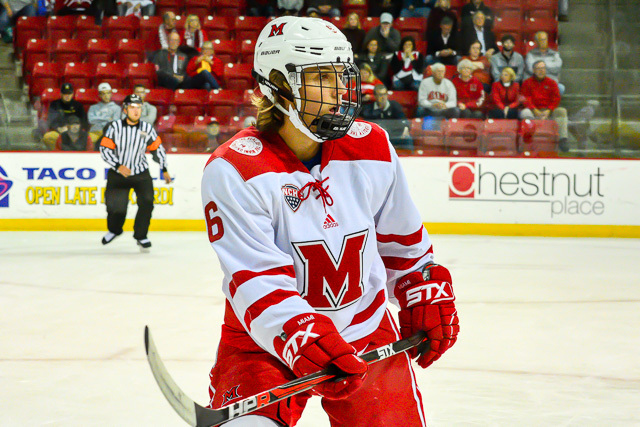 OXFORD, Ohio – For a period that did not see a goal scored, the final stanza of Saturday’s game was certainly bizarre. 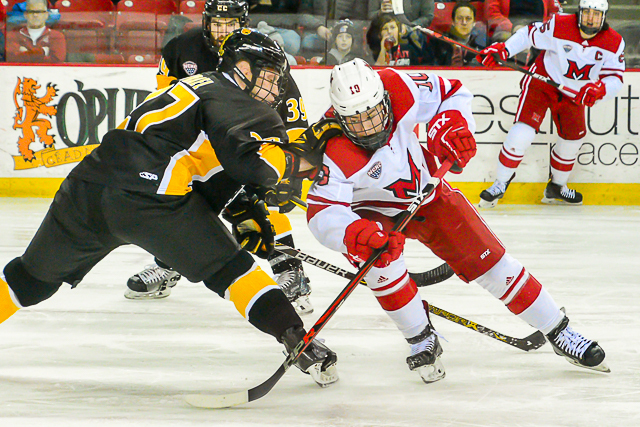 After scoring the go-ahead tally with 0.1 seconds left in the second period, Colorado College held on for a 2-1 win over Miami at Cady Arena as the teams split the weekend series. Just over six minutes into the third period, the Tigers appeared to have scored their third goal on a blast from the blue line. The RedHawks’ coaching staff, players nor goalie Ryan Larkin seemed to have any objection, but after a review the goal was waved off because of an alleged crease violation. 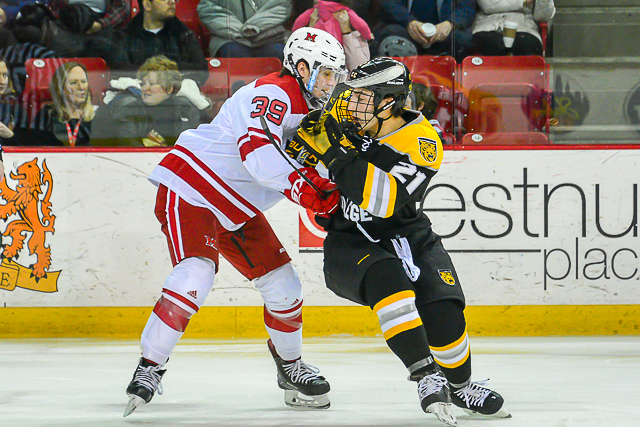 Already down a player – and Gordie Green for that matter – his linemate and top penalty killing forward Josh Melnick was whistled for tripping, giving Colorado College a 5-on-3 for a minute and a half. The Tigers were then assessed a holding penalty five seconds later, making it a 4-on-3 for 1:25. On a side note, if that was intended as a make-up call, cutting an advantage from 5×3 to 4×3 doesn’t help the shorthanded team much, since a 4×3 is statistically almost as lethal. But to continue, Miami killed the one-and-a-half-man advantage. A couple of minutes later, Green ripped a one-timer from the slot that went just wide, and the goal light went on erroneously. Then a Zach LaValle penalty with 5:14 left, and Casey Gilling received a 10-minute unsportsmanlike conduct on the same play (NOTE: The latter usually means a player used the magic word when talking to officials). Miami killed that power play and drew a boarding call with a minute left. But despite finishing the game 6-on-4, the RedHawks were unable to repeat Friday’s comeback heroics. Credit does go to the Tigers’ goalie Alex Leclerc, who stopped 26 of 27 shots. 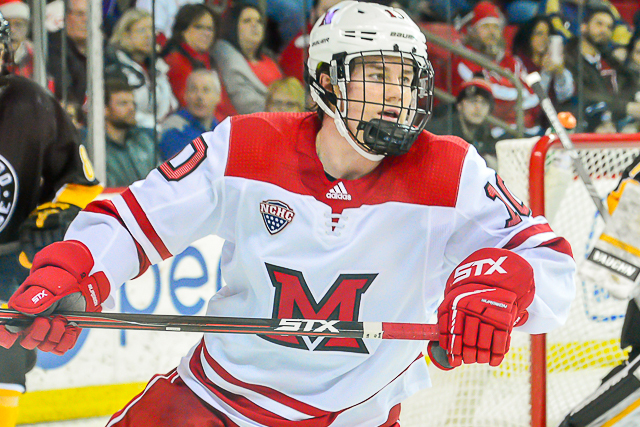 Miami went 3-1 on the homestand and is now 4-4 after a 1-3 start, but the loss stings because the RedHawks outplayed Colorado College overall in this one. On Friday, the teams were pretty even and both played well, but CC wasn’t on its game Saturday and Miami still couldn’t get any points. – Annual disclaimer that we like to keep criticism of officials to a minimum, since in theory it should even out and making them a part of the game can appear whiny and hurt credibility. That said, the refs didn’t have a good weekend. The power plays were 14-8 in favor of Colorado College for the series, and the Tigers weren’t that much better than Miami. Actually the opposite. It was called tight on Saturday, and then interference became a game strategy and was let go. To be fair, the goalie interference called on Colorado College in the first period on Friday was one of the worst calls at Cady Arena in some time. It stings more when the borderline calls end up in the violators’ net, and the Tigers scored three times on the man advantage this weekend. Miami had zero PPGs. – Miami had its chances but missed to net too often in this one. The RedHawks scored on their final shot of the first period and put 18 on net the final 40 minutes but none hit twine. A number more solid opportunities missed the net entirely, and there was also a late post on a one-timer (Grant Hutton maybe?). Miami possessed the puck a lot and ended the night with just one goal. – Not sure who failed to pick up Wade Michaud, who joined the power play rush late in the closing seconds of the second period, but he was left wide open to skate in and score the decisive goal. The replay quality isn’t great, but it appears the pass from the along the boards was partially deflected by Green and ended up right on Michaud’s stick. Melnick, Grant Hutton and Chaz Switzer were also on the ice for that critical kill. – A side note that Colorado College only had five healthy defensemen this weekend. So the Tigers are young (no seniors) and were shorthanded on the blue line, which means Miami will face an even tougher task when they head to Colorado Springs in January to play a jelling CC team at high altitude. – Nice to see a good crowd at Cady Arena. The listed attendance was 3,137, which is 120 off the season high set in the 2017-18 opener vs. Providence. FORWARDS: C. The group was decent overall but only finished once. The power play wasn’t that good. Time of possession was excellent, and that alone cut down the number of scoring chances for Colorado College. Overall this corps helped hold CC to five shots on eight power plays, which included an extensive 4-on-3. DEFENSEMEN: A-. 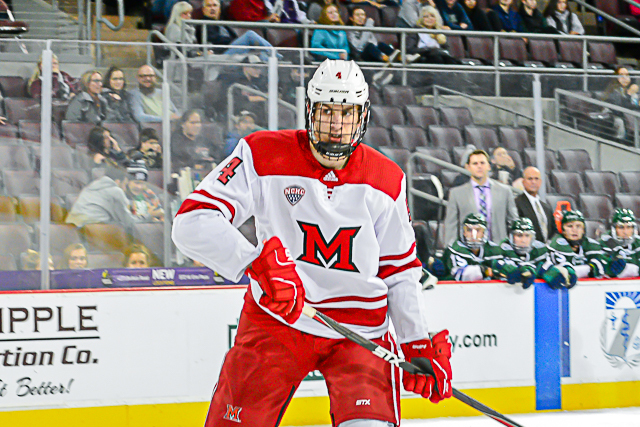 As mentioned above, the forwards made the blueliners’ job somewhat easier, but the D deserves credit for the Tigers’ shot total of 14, a season low allowed by Miami and the third time in four games the RedHawks have given up fewer than 20 shots. Louie Belpedio took the cross-checking penalty that led to the decisive goal, but it was unclear if that was a warranted call since it was behind the play and there wasn’t a good camera angle of it. Alec Mahalak logged some power play time and looked confident handling the puck. 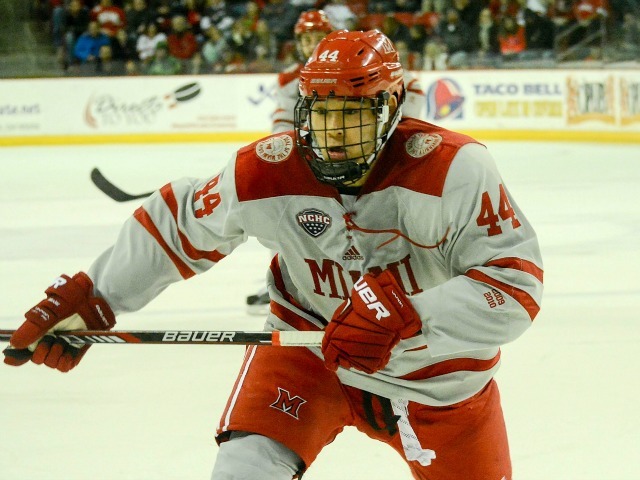 That gives Miami four blueliners who jump on for the man advantage, which is atypical for recent RedHawks teams. GOALTENDING: C. Ryan Larkin made one spectacular save, but he probably should have stopped one of the two goals. The first one beat him high to the glove side, and he appeared to have gotten the glove up in time. The second one was far enough out that he should’ve had a good look. He stopped only 12, putting his save percentage for the night at .857. That’s four straight games in which Larkin has allowed two goals or fewer. If he can do that most nights Miami should win plenty of games. LINEUP CHANGES: None. 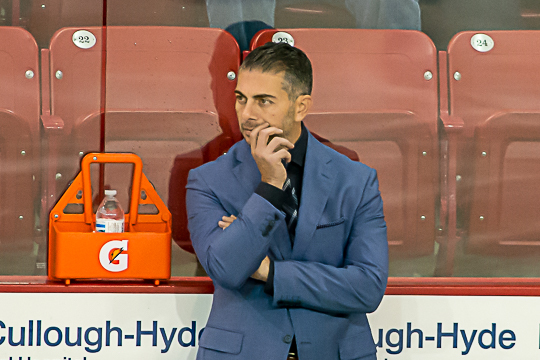 Coach Enrico Blasi continues to ride this corps of 18 skaters plus Larkin. It was not only the fourth straight game using the same 19, the lines are remaining intact. The latter may change if forwards not named Melnick and Green can’t pick up the scoring. The other 10 forwards slots have generated just 11 goals through eight games. It’s a shame to see the same faces in the stands each night but there are no easy answers when a team has 28 players on its roster.